For more than 20 years, Pixar has dominated the world of animation, rivaling its parent company Disney. Thanks to films like Toy Story, Finding Nemo, Up, and Inside Out, we can always look to this studio for a rollercoaster of feels. Their latest film is another example of that, looking at a story centered on the Mexican holiday Dia de Muertos or Day Of The Dead. Did we get the next Inside Out or the new Brave? This is Coco. A young boy named Miguel aspires to be a great musician like his idol, Ernesto De La Cruz. But his family has banned music, he’s unable to fulfill his dream. Suddenly, Miguel finds himself in the world of the dead on Dia de Muertos. He must find his way back to the land of the living while finding out about his family history. This is a story that we’ve seen before; a kid has a dream, but his family doesn’t believe in him for reasons, so he runs away somewhere and gets in some shenanigan while learning some moral. But the way Pixar tells this kind of story is good enough where you don’t even care. And it’s genius to incorporate Dia de Muertos. People have said that this film is very similar to The Book Of Life, another animated movie that’s also focused on Day Of The Dead. I’ll admit I haven’t seen The Book Of Life and looking at footage from that movie, I can see the comparisons. Then again, this is the not the first time two movies share the same elements nor is this the worst instance. First thing first, props to Pixar for the majorly-Hispanic cast. It adds some authenticity to the film that was needed. I was concerned I was either going to dislike or not care for Miguel (Anthony Gonzalez), but he wound up being a likable kid character. He’s determined to carry out his dreams in spite of his family’s objection. His idol is Ernesto De La Cruz (Benjamin Bratt), a famous musician beloved by the world who died before Miguel’s time. All this time, Miguel thought that Ernesto is his ancestor, but that’s not the case. This brings us to Hector (Gale Garcia Bernal), a charming trickster who wants to visit the world of the living and see his daughter. See, Ernesto and Hector were friends who were supposed to be famous musicians together, but Hector didn’t want to commit because he misses his family. In retaliation, Ernesto poisoned him, stole the songs he wrote, took credit for them, and became a superstar. In other words, Ernesto is a twist villain. In any other movie, this would’ve been stupid, but it works here and it contributes to the message. Do I even need to talk about the animation? It’s Pixar. Saying that a Pixar movie has great animation would be like saying the sky is blue. It’s kind of a no-brainer. Look at the backgrounds and colors and angles. I’m amazed by the amount of detail in the Land of the Dead. I also like the designs of the skeletons. They sort of humanized the look . The music is excellent and it fits the movie, especially the song Remember Me. That song takes on two different meanings through the whole film. At first, it seems like a song about wanting to be a famous icon that people will remember for a long time. But thanks to the twist, we find out that Hector wrote the song for his daughter Coco, who is Miguel’s great-grandmother. 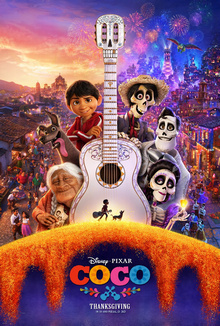 The last 10 minutes of the movie was a real tearjerker when after getting back to the land of the living, Miguel takes a guitar and sings Remember Me to his great-grandmother. This makes Coco recall her father, which she has a torn picture of in her drawer. There wasn’t a dry eye in the theater during the final scenes. I give Coco an 8/10. It’s another one of Pixar’s best movies. There’s great animation, great voice acting, great music, and a touching story with a lot of emotional weight. 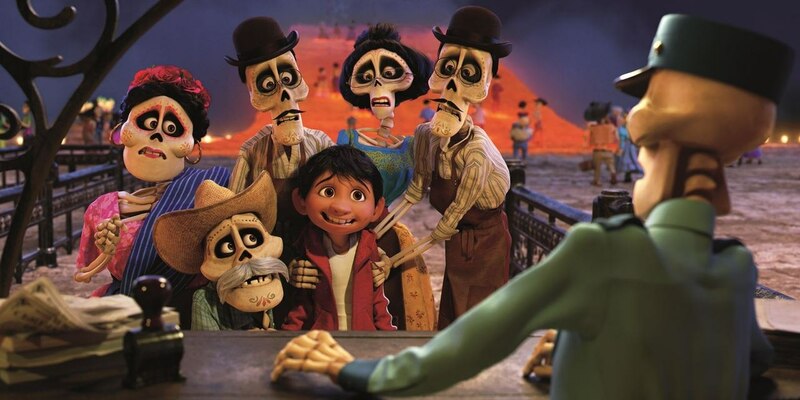 It does a fantastic job at portraying Mexican culture and its people and it shows that it’s never wrong to want to pursue your dreams, but never forget your family. Unless they’re all horrible people, then get the hell out of there. I digress. Great film. The next film from Pixar is one I’ve waited too long for, The Incredibles 2. If this movie did anything, it’s prove that Pixar is really back on track after a few somewhat disappointing movies. Obviously, Inside Out was the one that really got Pixar going again and with the exception of the misfire that was The Good Dinosaur and the ever-forgettable Cars franchise, Pixar is once again a force to be reckoned with in the animation department especially after this movie because this movie is spectacular. Though, I am not Mexican, I am hispanic and know a bit about Mexican culture, so I could relate to this movie. Even though some of the things that happen in this movie are cliched, it’s so well delivered that you completely forget about it because you’re very invested in these characters. Miguel is one of the most likable animated kid characters I’ve seen in a while, Hector was a great character and became the one I most cared for, and everyone else I really enjoyed. That is, except Ernesto, especially after seeing who he really was. This movie did what animated movies rarely do to me, it made me cry. Halfway through the movie, and especially the last part of film, I was really crying because I felt an emotional connection with these characters plus they felt real. It didn’t feel like I was watching an animated film and that really says a lot about Pixar and how good they are at putting emotional and realistic moments in their movies. The animation was a sight to behold, especially in The Land of The Dead, it felt epic. And the songs were great, too. They felt like real songs, and not song that were added to an animated movie. As far as the Frozen mini-film goes, look I’m not gonna mince words, it was unnecessary. It was cute and all, but it was just an effort by Disney to either a-) keep marketing Frozen, b-) basically be a LONG trailer for the upcoming sequel or c-) put it beside Coco to get more people to see it because they didn’t have faith that people would see a movie with people from a different culture. It dragged on a lot. I’m already sick of Frozen being everywhere and this kind of doesn’t help. I think Frozen is a good movie, but nowhere being a masterpiece, in my opinion. And if I have to hear Let It Go one more time, I’m gonna go insane. It was still good for what it was, but it was just another cash-grab to keep it relevant. The only reason I wasn’t all that pissed to see it was because I already knew to expect it and to its’ credit it was cute. Plus, I don’t really hate Olaf, so that helps. 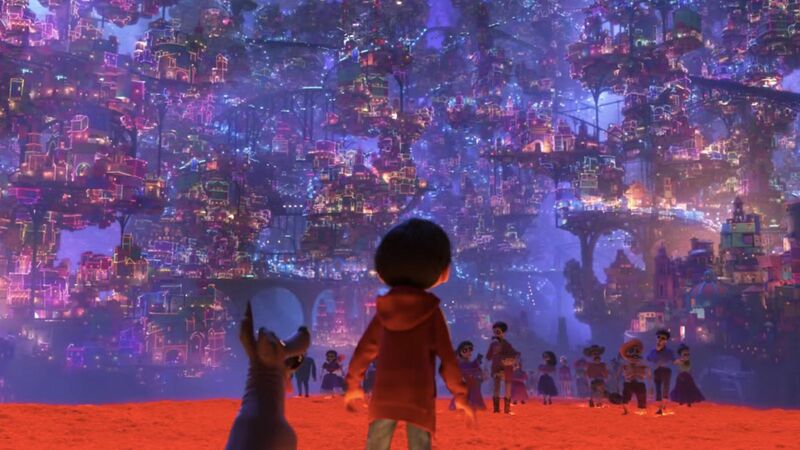 But overall, the wait is worth because Coco definitely ranks among my top 5 favorite Pixar movies now. It was really a great experience watching it, and I am definitely gonna see it again in the near future. Sidenote: the Frozen special they played before the movie went on for too long. I don’t hate it, but you could’ve done something else.